There are three main types of liquidation proceedings in Hungary. Voluntary liquidation procedure (in Hungarian: ‘végelszámolás’) may be initiated by the company itself if its assets cover its liabilities. If this is not the case, i.e. the company is insolvent, it may be subject to a bankruptcy procedure (in Hungarian: ‘csődeljárás’) or an insolvency procedure (in Hungarian: ‘felszámolási eljárás’). The former is aimed at the restructuring of debts of the company so it may continue its operation if it manages to make an arrangement with its creditors whereas the latter procedure inevitably leads to the liquidation of the company and the procedure merely focuses on the distribution of the assets of the company. It shall be noted that enforcement proceedings against a company are not aimed at its liquidation and are based on the assumption that the company is solvent. In case there is a reasonable risk that the company’s assets will not cover its liabilities, it is more advisable to file an application for initiating the insolvency procedure, since unsuccessful enforcement proceedings may turn into an insolvency procedure and that, if initiated by a third party, would anyway lead to the termination of the enforcement. If the court orders a grace period, the enforcement proceedings will be automatically suspended during such period and, if concluded, under the term of the agreement with creditors. a preceding motion was dismissed by the court and one year has not passed since the date of the resolution on such dismissal. The decision on the application shall be made by the general meeting of the company. The Civil Code does not stipulate any special rule on such voting, hence, generally, a simple majority of the votes is sufficient but the articles of association of the company may set qualified majority or other voting rules. The company shall inform its employees, the trade unions and the work council (if applicable). The managing director of the debtor shall make a statement on all significant changes in the financial situation of the company since the date of the last accounts and a detailed list of all creditors and bank accounts of the company. The managing director shall also declare that (s)he will inform all banks of the company on the application prior to its publication and that (s)he will refrain from any act that would jeopardize the objective of the moratorium or apply discrimination among the creditors. An insolvency procedure may be initiated by the court (e.g. if the bankruptcy procedure was unsuccessful), the debtor or the creditor. If the debtor is the applicant, the general meeting shall approve such decision (see above on voting) and the company shall engage an attorney to submit the application. The above mentioned duties of the company on informing its employees and committees as well as the duties of the managing director shall also apply. it turns out in a voluntary liquidation procedure that the assets of the company will not cover all its liabilities and the shareholders do not oblige themselves to hold the creditors harmless for the uncovered liabilities. It shall be noted that in cases a) and b), the insolvency procedure may be initiated only if the claim exceeds HUF 200,000. 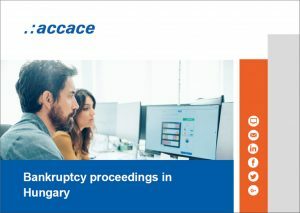 Both the bankruptcy procedure and the insolvency procedure starts officially with the resolution of the court that is published in the Company Gazette (in Hungarian: ‘Cégközlöny’). The date of publication is also the starting date of the period during which creditors may submit their claims on receivables against the company. In the bankruptcy procedure, such period is 30 days for the claims that became due before the date of publication. Claims that become due during the bankruptcy procedure shall be submitted within 8 business days from maturity date. In the insolvency procedure, the period for claiming receivables is 40 days. Since upon the date of publication of the insolvency, all receivables become due by law, creditors shall observe the above deadline with utmost care. It shall be noted that the resolution of the court also appoints a bankruptcy administrator (in Hungarian: ‘vagyonfelügyelő’) or an insolvency administrator (in Hungarian: ‘felszámolóbiztos’), respectively. Both persons are by virtue of law the exclusive representatives of the company from the date of publication of the proceedings, therefore, claims of receivables shall be submitted to their registered address. The timely submission of such claims is not sufficient; the creditor shall also pay a registration fee to the bank account of the bankruptcy administrator or the court ordering the insolvency procedure, respectively. The amount of the registration fee is 1% of the amount of the claim (excluding interest rate and other expenses) but at least HUF 5,000 but shall not exceed HUF 100,000 in the bankruptcy procedure and HUF 200,000 in the insolvency procedure. As mentioned in the introduction, any ongoing enforcement proceedings against the company will be automatically terminated upon the start of the insolvency procedure. The creditor who initiated the enforcement procedure shall claim his receivables the same way as all other creditors. On the other hand, creditors who submitted their claims during a bankruptcy procedure will not have to submit those again if the bankruptcy procedure turns into an insolvency procedure. enter into an arrangement with the creditors, provided that is supported by the majority of creditors in both classes of secured and unsecured claims. The arrangement with creditors may contain any provision aiming to restore the solvency of the debtor, in particular a partial or total write-off of certain claims, transfer of claims, deferred payment, stipulating securities, or even acquiring shares of the debtor. If the debtor does not achieve an arrangement with creditors or such is not approved by the court, it terminates the bankruptcy procedure and initiates the insolvency procedure. The debtor achieves an arrangement with creditors. This arrangement shall be approved by the majority of votes in all creditor classes (for creditor classes see Chapter V, for calculation of votes see above in this Chapter) provided the claims of the approving creditors amount to at least two third of the total amount of registered claims. The debtor pays all registered claims that are not disputed by him, and provides a guarantee to the extent of the disputed claims and the costs of the procedure. If neither of the above is possible, the court will divide the assets of the company as set out below. Claims of related parties and the management of the company. If the assets of the company do not cover all claims, the claims in the higher classes shall have priority and if the assets do not cover the claims in a certain class, the creditors in that class shall be satisfied proportionally. If there are creditors who submit their claims after 40 days following the date of publication but still within 180 days, their claim will be classified separately from the claims submitted within 40 days (which shall have priority) and according to the above classification. In B2B relations, a creditor typically does not secure its claim with a pledge, therefore, its claim is classified under Class 6 which, in most of the cases, remains completely unsatisfied. If the creditor misses the 40 days’ deadline, it usually does not make sense to submit the claim, unless the amount of the claim is significant compared to the other claims – and there is a chance to achieve an arrangement with the other creditors. The bankruptcy procedure is initiated by the debtor. To avoid that this tool be misused, the court may impose a penalty up to HUF 2,000,000 on the person submitting the application if it contains false information. A further type of misuse is if the management of the debtor pays a creditor during the moratorium. In that case, the court may impose a fine up to 10% of the paid amount. The managers of the debtor shall co-operate with the bankruptcy administrator and inform the court on the result of the negotiation of compromise. Failing to do so may result in a penalty up to HUF 500,000. The main duties of the debtor’s management during the insolvency procedure are (i) to prepare an inventory and the closing accounts for the date of commencement of the procedure; (ii) to make a statement on any significant changes in the financial situation of the debtor since the date of the last balance sheet; (iii) to prepare a list of company documents; (iv) to hand these documents over to the insolvency administrator and (v) to inform the employees. In the event that the managers fail to comply with these obligations or deliver false information, a fine of up to HUF 2,000,000 or 50% of their annual salary in the last year may be imposed on them. In addition, the insolvency administrator or any creditors may sue any person who was a manager of the company in the last 3 years prior to the starting date of the insolvency to establish that such person has not represented the interest of creditors since the financial difficulties started and such act led to the decrease of assets of the company or it jeopardized the satisfaction of claims of creditors in full. If this is established, any creditor or the insolvency administrator may request the court to oblige the manager to pay those creditors whose claims could not have been satisfied from the assets of the company. Need help with bankruptcy proceedings? Contact us!